State personal income increased in all but two states and inflation declined in the first quarter, according to estimates released today by the U.S. Bureau of Economic Analysis. The national average increase in earnings was 0.9 percent. Inflation fell to 0.4 percent from 0.6 percent in the fourth quarter of 2009. Tennessee posted better 1Q results than most states with personal income rising 1.4 percent, up from from 0.8 percent in the prior quarter. All in all, a pretty good report. However, there are some numbers that give us pause. Breaking down earnings by industry, BEA reports that construction and real estate earnings were down again. On the positive side, healthcare provided the biggest boost to earnings. A 3.4 percent pay raise for the military and a 2 percent increase for federal civilian workers also helped. Read the full BEA report here. This entry was posted in Personal Income and tagged Bureau of Economic Analysis, Inflation, Personal Income, Tennessee on June 18, 2010 by Roger Harris. New data released Thursday by the Bureau of Economic Analysis shows that personal income for Knox County rose 3.1 percent from 2007 to 2008, a reflection of the good times just before the recession kicked in. On a per capita basis, personal income for the county was $36,342 in 2008, seventh highest in Tennessee. Williamson County was No. 1 at $55,717, followed by Davidson County at $44,228 and Shelby County at $41,598. This entry was posted in Personal Income and tagged Anderson, Blount, Davidson, Knox, Loudon, Personal Income, Shelby, Union, Williamson on April 23, 2010 by Roger Harris. CORRECTION. 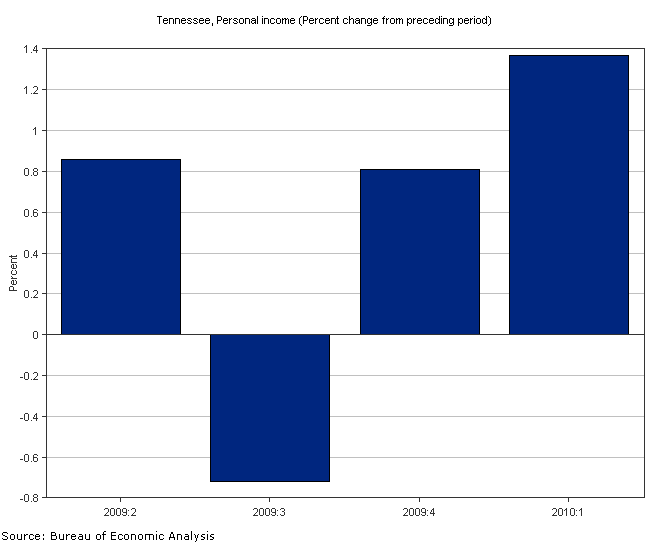 The original post had the incorrect percentage drop in Tennessee personal income. The error has been fixed. If you found it harder to make ends meet last year, there’s a reason. 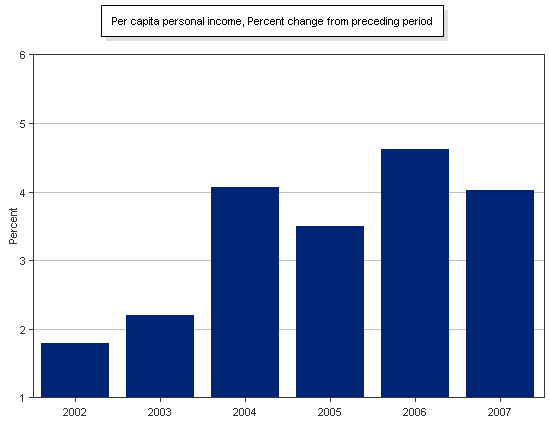 State personal income in the U.S. fell an average of 1.7 percent in 2009, the Department of Commerce said today. In Tennessee, the decline was 1.26 percent. In raw dollars, per capita income in Tennessee dropped to $34,089 in 2009 from $34,833 in 2008, according to a press release from the Bureau of Economic Analysis. Here’s a chart of the Knoxville MSA stats. This entry was posted in Economic Analysis, Personal Income and tagged Income, per capita, Tennessee, transfer payments on March 25, 2010 by Roger Harris.